I’m very happy about beginning my food blog journey, so hop on board and come along for the ride! Who knows where this blog will take us! Just so you all know, I’m still trying to iron out some things with the site, so please bear with me. Eventually, this blog site will be prettier once I get more advanced at it! I also included a travel page so you’ll see where I was, what I was doing and what I ate. It’s empty at the moment, but summertime is just around the corner, so I’ll be going places!! I’ve been scratching my head trying to decide on which recipe should be the very first one to post. I came to the decision to post about the last cookie I made. Recently a local high school was having a marching band fundraiser selling strawberries. If I had to choose one fruit to eat on a deserted island it’d be the strawberry. I looooooove strawberries! My mother-in-law and I split a whole flat, and waited patiently for them (Well, at least one of us did!). During the month-long, agonizing wait I was figuring out what to make out of them that is not just strawberry shortcakes. I thought trying them out in cookies, along with some white chocolate chips. Yeah, that sounds good!! Then the strawberries came, and they were so sweet and beautiful-looking that my daughter and I ended up eating half of half a flat!! I got cookies to make…Oops!! Luckily I reserved a pint of them, so all was right with the world. The cookies are very moist, but a bit sticky. Refrigerating or freezing them is the best way to keep them cool or to firm up a bit. Putting them in the cookie jar is a definite no-no! Don’t ask how long they can last in the fridge, because they last for a couple days in my house! Preheat oven at 350 degrees. 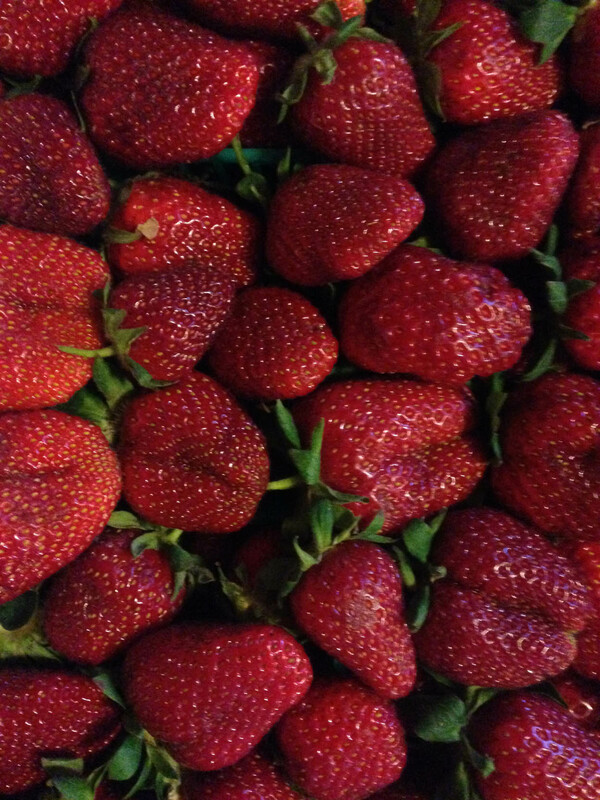 For the strawberries, wash and drain well, then cut off the stems and cut in quarters. Place in a gallon-sized zip-lock bag; add 1/4 cup sugar. Zip and shake the bag to evenly distribute the sugar. Refrigerate for 30 – 45 minutes. For the rest, mix margarine and sugars together in a mixing bowl until smooth. Add eggs and emulsion extract; blend well. In a large bowl, mix flour and baking soda. Mix gradually with wet ingredients. 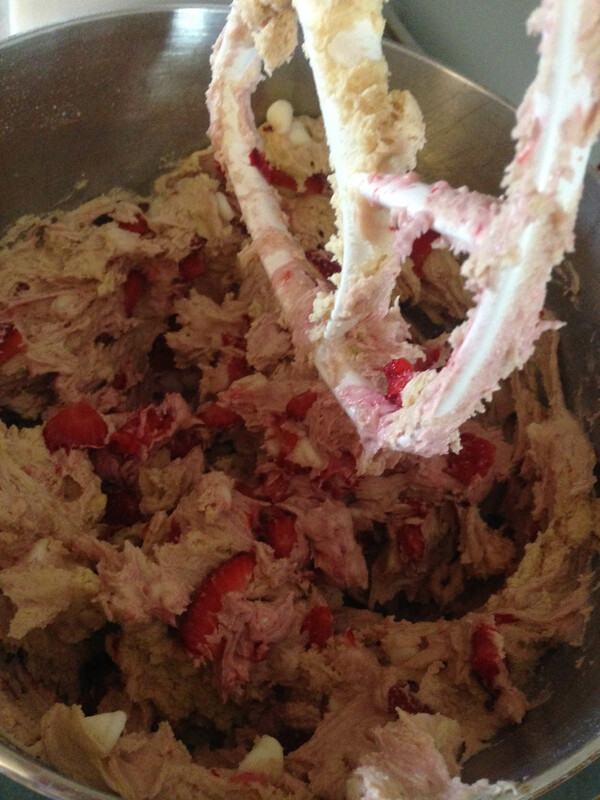 Add white chocolate chips and strawberries until mixed through. 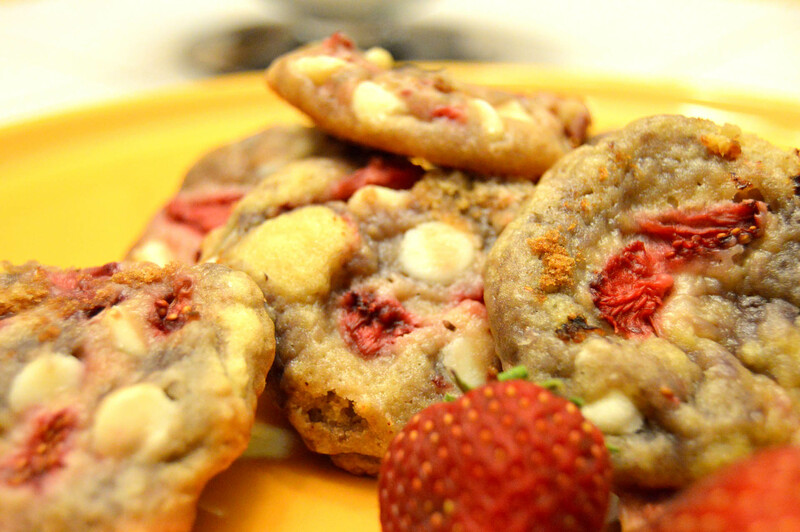 Drop by tablespoonfuls onto a greased cookie sheet. Bake for 13-15 minutes. Let cookies cool on wire racks. Refrigerate or freeze for storage. *Since I had no strawberry flavoring or extract I grabbed for the raspberry emulsion. 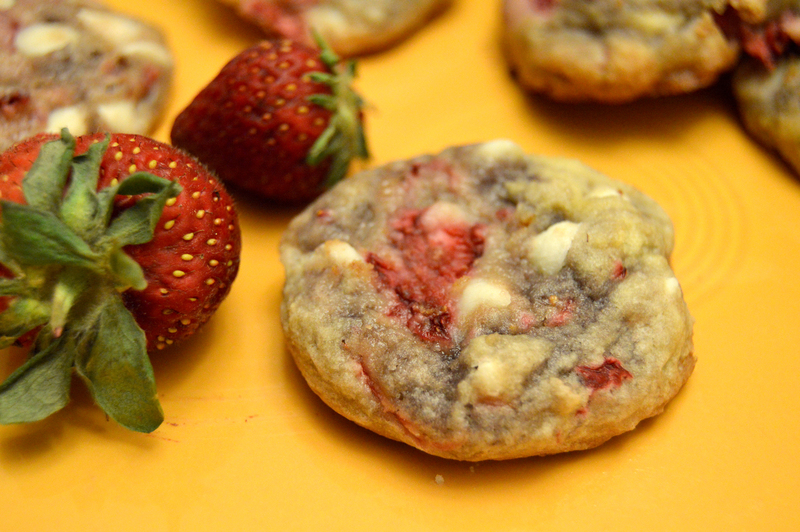 It smells great, and gave the cookies a nice, sutle flavor, and the taste goes well with the strawberries. Emulsion is stronger than extract, so a small amount is all you need. You can find emulsion at local crafts stores; I bought mine at Michael’s.